So it was with great intrigue that I read how Bugatti was having trouble selling 40 Veyron convertibles. After all, haven’t seven-figure performance cars been selling out lately at almost any price? Haven’t the McLaren P1, Ferrari LaFerrari, Aston Martin One-77, and the Lamborghini Veneno sold out by the time we've seen them? Exacerbating Bugatti’s woes is the fact the P1, LaFerrari, and Porsche 918 Spyder are going to be released soon. The One-77 has come and gone. The Pagani Huayra has been out for three years. And all of them, with the exception of the Aston, have the newest technologies engineered in and then some. Meanwhile, the Veyron is based on a design which was first debuted on a concept car in 1999. This has become a problem since it looks ugly compared to the new crop of seven-figure cars. 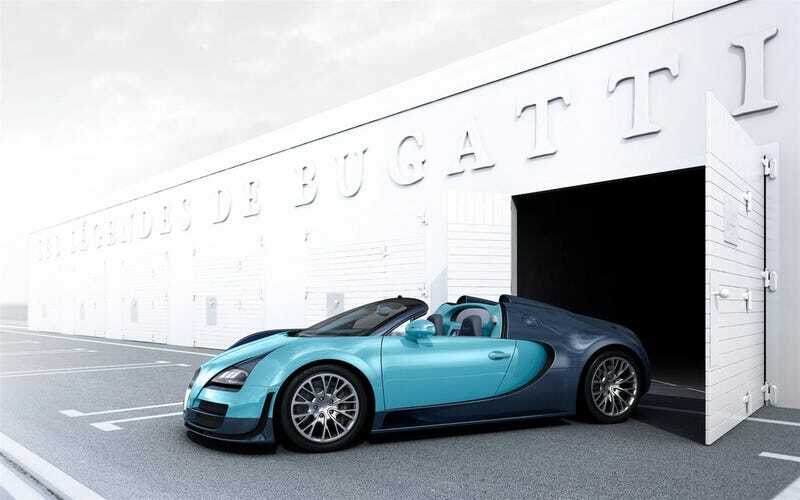 To justify the styling, Bugatti focuses on the Veyron to be the fastest street-legal production car in the world. Therefore, I had find out if the performance superseded the styling. Unfortunately (for me, certainly not for whoever insures Bugatti’s demonstration cars), I hadn’t driven the Veyron yet, and when I asked Bugatti for a demo car, I was given a resounding “Non.” So I promptly got off the couch and bought a brand-new 2013 model. This involved walking into the living room to ensure I had the resources, and then like all Bugatti buyers, spend hours in front of a large screen pondering the right color combination. To its credit, the Veyron was extremely fast in a straight line and the visibility was a lot better than expected. It also surprisingly escaped what could have been major collisions on the racetrack with relatively minor scrapes. And when I decided to race it on the streets of Tokyo, the car appeared as good as new. So Bugatti clearly has put plenty of effort into making the Veyron durable. But was the speed worth the styling? To me, it was a resounding no, since I never reached 250 mph while racing it. Would I buy something better-looking, slower, but about the same price like a LaFerrari (if someone decides to sell theirs a day after taking delivery)? The answer, like most other customers of the other seven-figure cars, is yes. Then there’s Bugatti’s other strategy for driving sales, which is creating and selling as many special-editions as they possibly can. Once a quarter since 2010, Bugatti has unveiled a new special-edition intended to be a tribute to something which people either don’t know or care little about. The special editions worked when the par Hermés and L’Or Blanc (the one with porcelain) came out. But the recent “special editions” like the Rembrandt Bugatti edition and the Jean Bugatti Legend edition are simply color schemes with some extra stitching in the interior. Little do the customers for these cars care about the heritage. Now let’s discuss my way of how Bugatti should take hostage of entice new or existing customers to buy these vehicles. I’m a proponent of selecting Bugatti’s crème-de-la-crème of customers and getting them to each create their own rebodied Veyron, for let’s say, $10 million, and create their own unique cars. At this point, these customers already have the fastest machines. They want something that’ll differentiate themselves from the other superrich in their area, like customers in London, Singapore, Monaco, Miami, and Abu Dhabi. These are the types of owners who’ll leave their expensive cars parallel parked on Rodeo Drive while buying their new watch from a company you’ve never heard of. And the customization model has been proven, especially at Ferrari. Look at Jim Glickenhaus and his Enzo-based P4/5 Competizione. The 599-based P540 Superfast Aperta. Every year on prominent Concours d’ Elegance lawns, be it Amelia Island, Villa d’ Este, or Pebble Beach, there’ll be an automaker like Ferrari, Maserati, or Alfa Romeo stealing the show with a new one-off. Meanwhile, Bugatti will feature a special edition somewhere nearby, hoping a buyer will come forward for that very car and take it off their hands. It’s not just Ferrari and its sister companies. Bugatti’s sister brand, Lamborghini, showcases a restyled version of its existing vehicles and then sells it for high prices to existing customers at least once a year. Even sight unseen. Such was the case with the Murciélago-based Reventón, the Aventador-based Veneno, and the Gallardo-based Sesto Elemento. These cars were made in limited-numbers and sold for millions of dollars each, despite having more polygons on a car than you ever thought possible. Bugatti has that bespoke heritage of creating customized cars. And since the operation is bankrolled by the Volkswagen Group, the end result should be high-quality, like the 8C-based Alfa Romeo TZ3 Corse and the Viper-based TZ3 Stradale. Even with a different exterior, the car is probably still capable of over 200 mph, considering all the development work that went into it. But for customers on their second Veyron, allowing them to commission their own with a customized body will make Bugatti something truly special. Like most Bugattis sold, the cars won’t be reaching 250 mph anyway, since they are essentially trophy items. Allowing preferred customers to customize the styling of their Veyrons for a high price will benefit all parties involved. Bugatti can get more money out of customers. Customers can actually have a Bugatti unique from their neighbors. Bugatti might actually be able to make money on each car it sells. The Veyron project can be thought of as successful. The Volkswagen Group can greenlight a successor. Car enthusiasts can salivate at something whose aim is to outdo the McLaren P1 and LaFerrari. Most importantly, though, Bugatti will finally have a car that looks different to the eyes at each auto show every quarter, rather than forcing its customers and the public to accept a new color scheme, and ending Veyron production gracefully. As long as a Kardashian doesn’t order one.